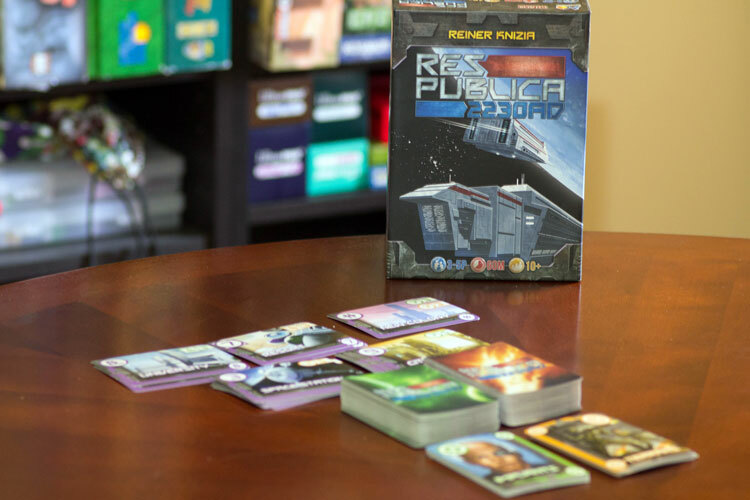 We review Res Publica 2230AD, a card game from designer Reiner Knizia. In Res Publica 2230AD, players are trying to acquire the most victory points by playing cards and trading with the other players. One of the reasons I gravitate toward board games as opposed to, say, video games, is the social element of being able to sit down with friends or soon-to-be new friends and enjoy a quick game. 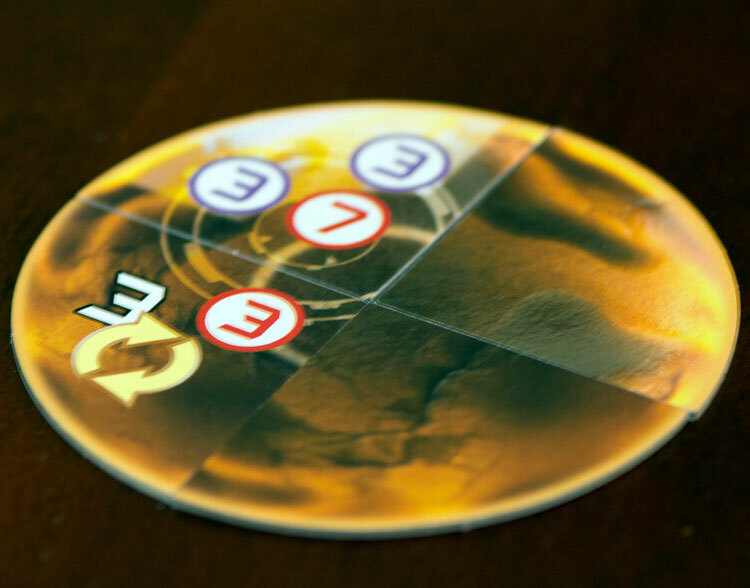 While the amount of interaction between players in a board game can vary greatly by game, some of my best board game experiences come from games where I am able to not only win, but feel more clever than my friends at the same time. Res Publica: 2230AD is nothing if not interactive. You try to trade with and possibly slightly manipulate other players to be the first to complete missions and score the most victory points. Res Publica: 2230AD is a game for 3-5 players that plays in about an hour. 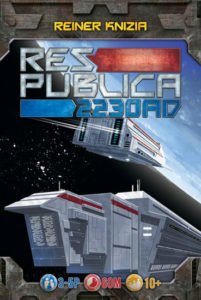 Res Publica: 2230AD is a slightly modified and reskinned version of a much older game, Res Publica. Designed the Reiner Knizia, the original was set in ancient times, but now we’ve clearly progressed into the future and colonizing space. Players will attempt to trade race and technology cards with each other to collect sets. Sets can be cashed in to complete missions or build useful buildings throughout the game. Each player has 4 missions and once one player has completed all of their missions, or the technology deck runs out, the player with the most points is the winner. Res Publica: 2230AD encourages players to trade to collect sets and turn those in for locations. Component-wise, Res Publica: 2230AD is mostly a card game and the cards are of pretty good quality. Each race and technology-type has different artwork. The art fits well with the theme and the art for the races makes them feel quite different from each other. Each player also gets a player board with some reminder information. It’s impressively comprehensive. Although it is two-sided and there is important info on each side. I found myself flipping the board over and over throughout each of my play throughs of the game. There are two problems with the production of Res Publica: 2230AD that drove me crazy. First, to call the rulebook terrible would be overselling it. The rules on trading are integral to the gameplay and are poorly worded. There are just a couple examples scattered throughout the rulebook that aren’t particularly instructive. We found ourselves making a couple house rules to be able to get going without continuing to re-read the rules. Lastly, the box is unforgivingly small. Don’t get me wrong – I hate oversized boxes as much as the next guy, but trying to pack this game up is a chore. There is no insert but if you don’t put everything back very, very carefully your box lid just isn’t going to fit on there. Another inch or two would have been much appreciated. Each player starts the game with four race cards and each turn will attempt to trade with other players, play any card effects they may have, turn in completed sets, and draw new cards. When attempting to trade with other players you are limited in exactly what you can say to try to complete a trade. You must either offer a particular number and type of card or request a number and type of card. However, you can’t do both. Each of the six technology cards has their own art. If you request, for example, one Skythris card, players in turn order will tell you what they would want in return. It is possible to qualify your trades with an “or” statement. So someone could respond that they would give you a Skythris for “a Galesh or a Warp Speed.” Once the trade is agreed to you have to give up the card that was offered. For 3 identical race cards and 3 identical technology cards, a New Colony. Each of these locations provides victory points and potentially other incentives. 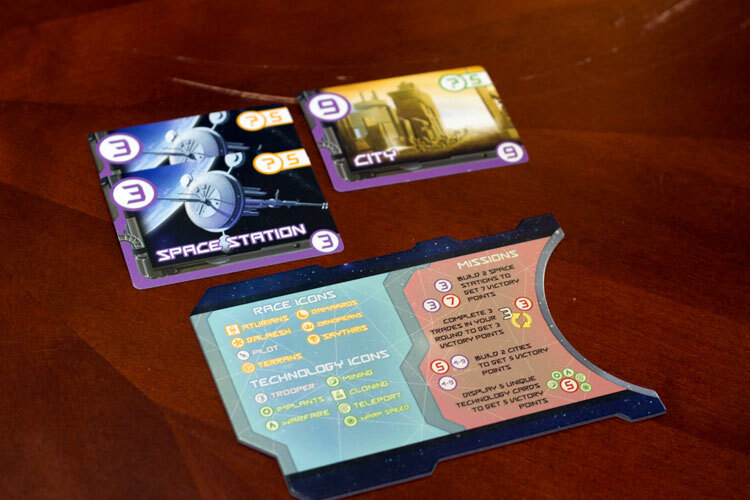 For instance, for each space station a player has, they can draw a technology card at the end of their turn. Cities and resorts only provide victory points. The University and New Colony allow players to discard cards for new ones and to acquire cities with less technology cards. At the end of the player’s turn they will draw 1 race card and a technology card for each space station they own. So at the beginning of the game, players are only drawing race cards. The missions players must complete to finish the game include building two space stations, two cities, completing three trades, and finishing a set of one of each technology cards. 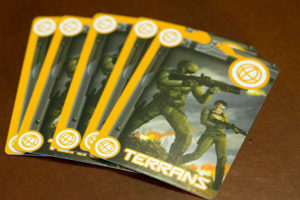 Once any player has completed all missions, each player may claim whatever locations they can with the cards they already have and then the player with the most points is the winner. Each player receives a double sided player aid with all of the information on races, technology, missions, and turn structure. Res Publica: 2230AD is an interesting game, but your enjoyment of it will hinge on how you feel about the rules on trading. It is certainly unique to limit exactly what information is available to the players when you are trying to make trades, and this will lead to some clever offers throughout the games I’ve played. That said, the beginning of this game is extremely slow. Each player only starts with 4 race cards and there are six different races. It felt quite a lot like a terrible game of Go Fish at the beginning. Maybe you have two Terran race cards so you just request those during your trade phase. But if other players do not have Terrans or don’t want to trade them, you just draw a card and end your turn. The planet pieces represent missions that players race to complete. Once you have built a space station or two and draw more cards each turn this problem becomes somewhat limited. However, you still need to be able to complete trades and it often comes down to just giving someone what they want in exchange for what you want. 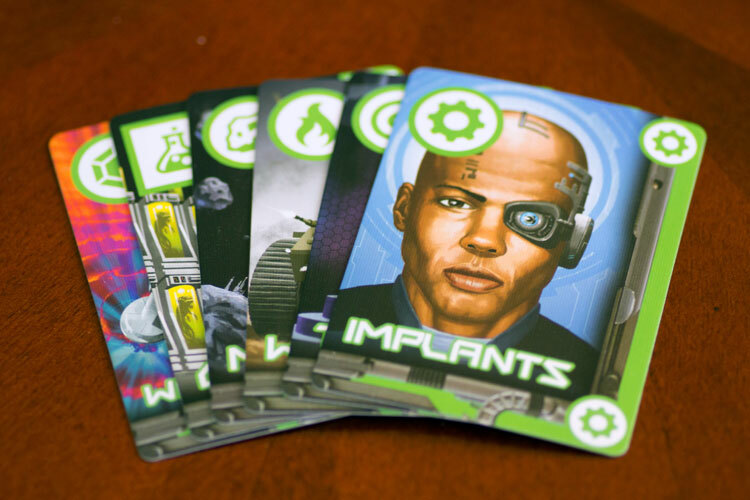 If you know an opponent needs a Warp Speed card, you can be kind of cute and offer “Warp Speed or Implants,” and then hope they agree and just pass them an Implants card. But that trick only works once before the person will no longer trade with you unless they know exactly what they are getting back in return. There are also two special cards, Pilots in the race deck and Troopers in the technology deck. Pilots act basically as a wildcard for races and can be used to complete a set for any race. Troopers however are used to play during other players’ turns to stop them from using a location. By discarding a Trooper you can stop someone from drawing a technology card for their space station, for example. While the Pilots were fine, I really hated the Trooper cards. You never really did much to hurt an opponent’s plans and just felt like you were attacking them because you drew a terrible card. In a game that is all player interaction anyway, this felt like an unneeded mechanic. A set of 5 identical race cards will earn you a bright, shiny new space station. The biggest concern I have in Res Publica: 2230AD is that once a player completes their first set of race cards and claims a space station, they get a huge advantage on other players. If a player goes multiple turns with more space stations than the other players it is extremely difficult to catch up to them. They will be able to claim the first cities which offer the most points or the other locations giving them special powers. In either case, they just continue to pull further ahead. I really wanted the “strict” trade rules in Res Publica: 2230AD to be more interesting than they actually are. Rather than limitations forcing you to be clever or conniving, I really just felt hamstrung. The game seems to come down to who draws the best cards at the beginning of the game. Once you put out a couple space stations, you can leave you opponents in the dust. The mechanics in play here are interesting. There is certainly something to be said for each of the location options and which locations you build first can each lead to their own strategy. If you really love trading and negotiation games you may find something to like in Res Publica: 2230AD. But otherwise, give it a pass. If you’d like to get a copy of Res Publica: 2230AD, it appears to be between printings, so you might have to wait a bit. Final Score: 2 Stars – The unique trading mechanics ended up not working as well as they should have, and, combined with other issues, definitely hold this one back.